Septic pumping is a very important step in maintaining your septic tank system. A septic tank is typically installed for a business or residential area because there is not access to a public sewer system. 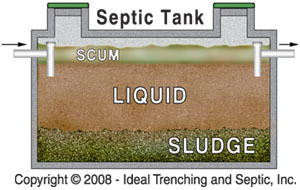 A Septic Tank is a large tank that is installed underground to hold all waste that is delivered to it. Theses tanks come in various sizes. Typically the city or county has specifications as to what is required for the size of the domain and the number of bathrooms in the facility. Your county/city permitting will have details, requirements and specifications. If your septic tank system is pumped on a regular basis you should be fine in terms of maintenance.DO NOT poor bacteria killing chemicals into your septic system such as acid or paint thinner! 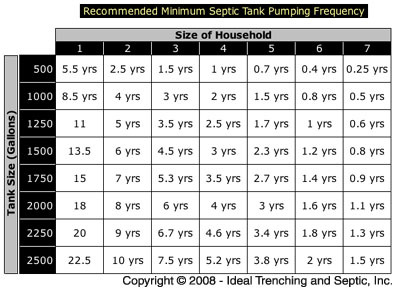 Besides pumping your system when needed there are other actions to take to also help take care of your septic tank. DO NOT flush foreign objects as tampons, paper towel, maxi pads down your toilet. REMEMBER if it won’t dissolve in water it will eventually need to be pumped out. Also DO NOT allow GREASE down your drains. Even in small amount this can be a problem in the future. And when designing your landscaping know where your septic system is try to avoid planting trees near your septic system and leach field/pits. Tree roots are a very common cause for damaged pipes. Water build up outside near your septic or leach field/pits. This once again could mean your tank of full or there is a more serious problem. If your tank is being pumped when needed (see chart to right) then we know this could be a more serious problem. Your septic system is a part of your home.Understanding your septic and how to take care of it is important. If you have questions about your septic system please call us before it’s to late! But if that unfortunate should happen you can know we have your best interest at heart. We are honest people and will explain your options. There are many signs that you may need sewer jetting at your home or business. For example, at your home you may experience slow water drainage in your bathroom sink, kitchen sink, shower or bathtub. There can be a variety of reasons that may cause a clogged line or a build up of some kind in your plumbing line(s). Your shower drain may have a build up of hair combined with shaving cream, conditioner, soap scum residue and mineral deposits and after weeks or even months of this repeated over and over may cause a build up in your drains therefore possibly needing a sewer jetting service. Your kitchen may have food debris or solidified grease stuck in the line therefore causing water flow and drainage problems. Below are just a few of the simple steps to follow that will help you and your pipes. 1. When preparing food in the kitchen try not to allow large pieces of food to go down your drain also NEVER poor grease down your drain (most common mistake) When the grease cools it hardens into a solid therefore clogging up your drain. 2. Another very common mistake but a very important one - DO NOT flush tampons down the toilet. Tampons expand in your pipes therefore obstructing the pathways for flow. Although this may seem strange or unsanitary, that is not true at all. Most public facilities furnish their bathrooms with trash receptacles for this very reason. If your at home or at another residence simple wrap the tampon in toilet paper and place in the trash can. Sewer jetting is a simple process which involves the use of a high pressure hose and water. The pressure is between 2500-4000psi and 3 GMP to 20 GMP. During the jetting process the pressure can be adjusted as needed The hose is put into the line with the problem and the pressure loosens the clog then either pushes the debris back up to be removed by a pump truck otherwise known as a "vacuum truck". This process can also be used for GREASE as well. This process is simple and cost effective. Your pipes will be running like new again! Some of the most common reason for line repair are flushing materials that are not meant to be flushed. For example, grease, tampons, motor oil, childrens toys, Q-tip, cotton balls, etc. Another major cause of damage to sewer lines, water lines and sometimes septic tanks is the over taking of roots. Try to avoid these items when at all possible and when planting trees, plants or any other vegitation do the research to find our how large the root system will get. When sewer line repair is necessary our team knows you take pride in your home and landscaping and so do we. We have the equipment to reach in those tight spots or a wide open area. 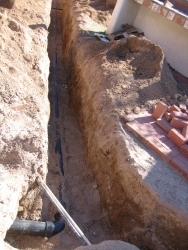 In addition to septic system services, we offer extensive trenching services for nearly any project or need - to include, emergency repairs, sewer line replacements, underground utilities and extensions. WE NOW OFFER HYDRO EXCAVATING! Our experienced staff has both the knowledge and the right equipment to complete the job quickly and correctly. We offer a no-nonsense honest job estimation service! We are committed to providing you with a fast, accurate assessment of all options available, including time and costs. Call us today for a no-obligation assessment on your project! Here at Ideal Trenching & Septic Service we know that a plumbing problem is always an unpleasant surprise. No one is ever prepared for a plumbing problem! We certainly don't anticipate anything to happening during a Holiday party or even a family gathering. Those nasty smells or even a dirty backup in the shower or an over flow of the toilet. Our septic, sewer and drain cleaning specialists have the expertise, common sense and the technology to take care of your needs. Our findings are discussed with you along with your options to rectify the problem and to inform you on the future care of your system. Arizona’s statewide inspection program for on-site wastewater (septic) treatment facilities inspection are triggered by the resale of a home by an owner or with the assistance of a real estate professional. The inspection requirement applies to any property served by a conventional septic tank system or an alternative on-site system. Inspection Program Under this program: The seller of a property served by a conventional septic tank or alternative system shall retain a qualified inspector to perform the transfer of ownership inspection within six months before the date of property transfer. The inspector shall prepare a Report of Inspection (ROI) form, and provide it to the seller of the property. The ROI is not filed with ADEQ, as it involves communication on the status of the on-site wastewater system between the transferor/seller and transferee/buyer The seller shall provide to the buyer the completed ROI form and any documents in the seller’s possession relating to permitting, operation and maintenance of the on-site system. Within 15 calendar days after the date of the property transfer, the buyer shall complete and submit a Notice of Transfer (NOT) form with fee to ADEQ. Submittal of the seven-page ROI is not an acceptable substitute for the two- page NOT form.